The 50CT KDF/GAC Filter is easy to install. Just attach it to your faucet, no plumbing is required. This unit easily disconnects, and it can go where you go. 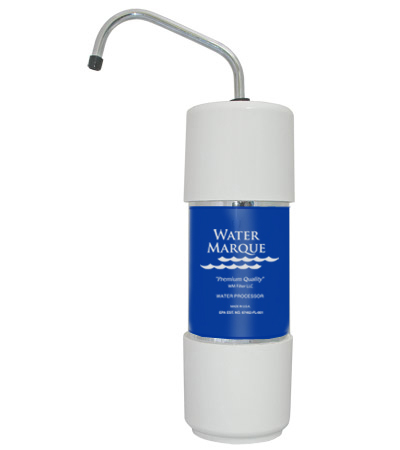 This commercial grade, in-line water treatment unit is used with COLD WATER ONLY. It features state-of-the-art engineering and design that has surpassed the most rigorous and demanding quality assurance testing. With the 50ct, your whole family will enjoy cleaner, better-tasting drinking and cooking water. The system will remove chlorine, bad taste, odor and color from your family's water. The 50CT will also remove lead. Utilizing Granular Activated Carbon and patented KDF media, this unit is bacteriostatic, meaning it will inhibit bacteria growth from within the unit. KDF also enhances the carbon's ability to remove chemical contaminants by removing most of the chlorine from the water before the water contacts the carbon, thus freeing up the carbon to perform higher levels of filtration. Use the 50ct system for all kitchen water needs, drinking water, ice, juice concentrates, coffee, tea, cooking, pets, plants and more. Available at a fraction of the cost of bottled water. Faucet Adapter Included. Capacity : 2-3 Years or 5,000 gallons under normal use. Average Weight: Dry- 4lbs., Shipping -5lbs. 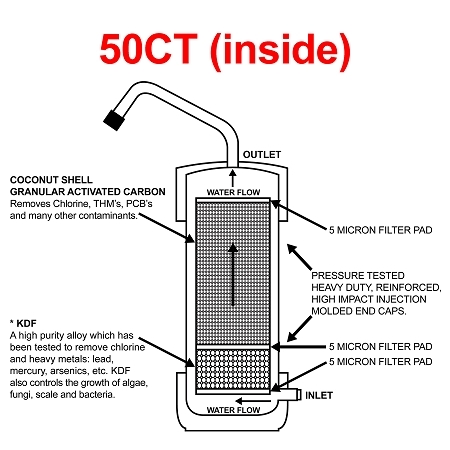 50CT Counter Top KDF/GAC Water Filter replaces NSA model 50c. Should not have changed out the hose attached to the container. Keeps popping out. The last 50CT hose was permanently attached. Works after a fashion. 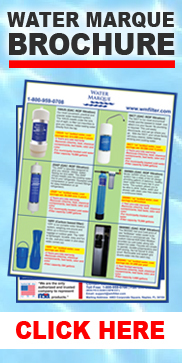 We've been buying water for more than 30 years and we've tried many different filters. This is by far the best we've ever tried. The quality of the water is immediately noticeable. I can think of no better gift for my loved ones. 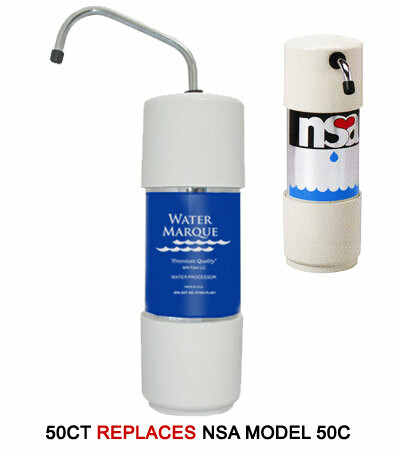 If you love someone, give them a NSA Water Filter. Very Satisfied with the 50CT Filter purchase. Easy to install. If I was to make a small recommendation is that the filter sit in a base which would in turn rest on the counter. This would prevent swiveling of filter and having to redirect spout all the time. Been using the 50C and 50CT now for 20 years, have gone though several and they work great. Love the filter. The attachment to faucet works, but restricts flow from faucet. The old attachment, which was a pressure sensitive one, worked better.